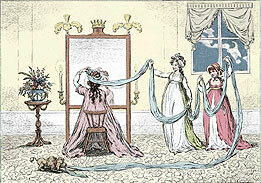 Upper-class women in the Regency were expected to turn a blind eye to husbands who dallied outside marriage. Once a wife produced an heir however, she, too, could take a lover. For all its excesses, the Regency upper-class lived and died by rules. (You could call them the first “Rules” girls.) So, of course, one of the great contradictions was how men and women were expected to behave. Meanwhile, society happily embraced young women prone to hysterics, fainting fits and swooning. Bottom line: The wise young Regency woman learned just enough math to be able to safeguard the household budget. Ironically, it would be during the Regency, as arranged marriages gave way to unions of love, that women with good conversational skills finally came into favor. After all, who wants a dull companion for life? Regency and Georgian men and women could be quite randy. The Duke of Queensbury had an illegitimate daughter, Mary, by an Italian marchesa (the equivalent of an English marchioness) and easily convinced an earl to marry his darling daughter. The founder of the Smithsonian Museum started life as the illegitimate son of the first Duke of Northumberland and a wealthy Bath widow. He was born abroad (discreetly) in Paris, and eventually brought back to England to be educated. William IV, Prinny’s youngest brother, had ten illegitimate children with an actress, all of whom were given titles or married off to lords. The higher in rank you were, the more your indiscretions were overlooked or swept under the table. But lower-ranking women could have a rough time. Many was the story of a fallen woman on the stage or in the brothels who’d been a gentlewoman before she was seduced. Which is why my club members are trying to keep the rogues at bay!